DCLG has reported 123,200 total applications for English councils in the quarter ending June 2014 – a 1% decrease from April-June 2013. In the same period, Wales Government reported 7,017 total applications – a rise of 14.1%. For the same period the Planning Portal processed 112,817 online applications (a rise of 19.4% on the same quarter last year). This means that approximately 86% of planning applications were submitted via the Portal in Q1 2014/15. 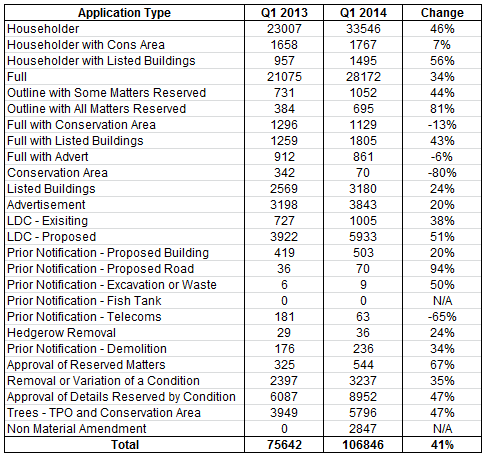 Below is a breakdown of applications through the Portal for Apr-June 2013 and the same period 2014. Some of the changes are as a result of policy changes or the introduction of new form types into 1app, but it gives you an idea of how different the profile is. We can’t show this in relation to the PS1/2 data as it collected/published by application type. Hi There you may have 86% using the portal, but i have tried time after time and I cannot finish with adding the drawings, so gone back to paper hard applications. so much simplier. Sorry to hear that Neil. Our account management team will be in touch to see if we can help you. It would be more interesting to have an analysis of what these applications were for. I have been casually monitoring local planning authorities in my area weekly, and it is crystal clear that the number of applications for new dwellings is nothing short of dismal – usually one or two applications a week at the most, almost invariably single plots, and no large developments. Most of the blame lies with the Coalition’s Community Infrastructure Levy – copied and renamed from Gordon Brown’s Planning Gain Supplement – when any additional infrastructure truly needed has always been funded from the additional annual council tax income produced by the new dwellings, and when Council Tax has not been reduced now that CIL is funding it, and then some. CIL increased house prices by around 15% at a stroke, excluding legions of first time buyers from the housing market. We of greater age remember only too well that Labour governments led by Harold Wilson in the 1960’s and 1970’s tried to tax planning permission twice with disastrous results on both occasions, first for the housing market and then for the economy generally. It is astonishing that politicians introduced something that has twice proved utterly disastrous, and yet expected a different result when they tried it this time. I am surprised when I look at applications on LA planning sites to see that drawings are never marked with the size of paper they were drawn on noted, with no scale bars, and no confirmation that the .pdf version has been opened on another computer than the one they were drawn on and were plotted and scaled correctly. Because I couldn’t do that final part, I had continued with paper submissions but is seems no-one else bother with that requirement.